Lavish parties. Secret trysts. Bone-chilling murders. Angels. Demons. Midterms. The day-to-day lives of Schuyler Van Alen and her Blue Blood friends (and enemies) are never boring. But there's oh-so-much more to know about these beautiful and powerful teens. Below the streets of Manhattan, within the walls of the Repository, is a wealth of never-before-revealed information about the vampire elite that dates back to the dawn of history. In a series of short stories, journal entries, and intimate letters, New York Times bestselling author Melissa de la Cruz gives you the keys to the Repository and an even more in-depth look into the secret world of the Blue Bloods. Won't you come inside? This was the first companion novel to a series that I have ever read. Since I'm no fan of short stories, I wasn't sure what I was going to think of it. 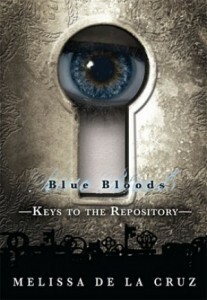 Keys to the Repository contains two bonus chapters: one featuring Jack and Schuyler, and one featuring Dylan Ward. It also gives us the first two chapters of Misguided Angel (yay!). From reading other bloggers' reviews, I understand that some fans of the Blue Bloods series were confused reading The Van Alen Legacy. I was able to follow the story just fine, but I had re-read the first three books in the series right before The Van Alen Legacy's release, so it was all fresh in my mind. One of the things I love most about this series is that the story is so multi-layered and steeped in history. I like that we can trace the origins of the Blue Bloods back through time. Keys to the Repository provides helpful character bios and is like a refresher course in preparation for Misguided Angel. It's not a must-read for fans of the series, but I would definitely recommend it. Some of the writing was pretty dry. At times it felt like I was reading a history book. Without a doubt, it's the chapter about Jack and Schuyler's first meeting at the Perry Street apartment. That chapter alone is worth the price of the book!